Thanksgiving dinner was great. The turkey was moist, the collard greens were just like my mom used to make and my wife made a wonderful sweet potato cake. Having stuffed ourselves with turkey on Thursday, followed by turkey sandwiches on Friday, another round of reheated turkey looked less and less appealing. By Saturday I realized had to do something, anything, with the leftover turkey. I went looking for something different, a new recipe that put some “growl” into yesterday’s “gobble”. 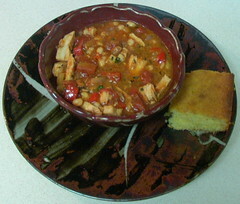 I happened onto this recipe for Chili-Flavored Turkey Stew With Hominy and Tomatoes. What a delicious change of pace from the mild Thanksgiving fare. I only deviated from the recipe by adding a bit of Tabasco (the kids were away) to spice it up for my wife. I match it up with some cornbread for a filling meal. This recipe may find its way into the regular Leftover Les dinner rotation. I will probably replace the leftover Thanksgiving turkey with packaged cooked turkey breasts strips. Heat oil in a large, deep saute pan over medium-high heat. Add onion and bell pepper; cook until soft and golden, about 5 minutes. Add garlic and chili powder; continue to cook until fragrant, 1 to 2 minutes longer. Add tomatoes, broth and hominy; bring to simmer. Reduce heat to low and simmer, partially covered, about 10 minutes, to blend flavors. Add turkey, salt and pepper. Simmer until heated through, about 5 minutes. Stir in cilantro. Serve with tortilla or corn chips if you like.